Planetariums and museums posted "Sold out of eclipse glasses" on their front doors. Signs along highways reminded motorists of "Solar Eclipse Monday," while cars bore the message "Eclipse or bust." With 200 million people within a day's drive of the path of totality, towns and parks braced for monumental crowds. It's expected to be the most observed, most studied and most photographed eclipse ever. Not to mention the most festive, what with all the parties. "It's one of those 'check the box' kind of things in life," said Hilary O'Hollaren, who drove 30 miles from Portland with her two teenagers and a tent, plus a couple friends. The Earth, moon and sun line up perfectly every one to three years, briefly turning day into night for a sliver of the planet. But these sights normally are in no man's land, like the vast Pacific or the poles. This will be the first eclipse of the social media era to pass through such a heavily populated area. The moon hasn't thrown this much shade at the U.S. since 1918. That was the country's last coast-to-coast total eclipse. In fact, the U.S. mainland hasn't seen a total solar eclipse since 1979 -- and even then, only five states in the Northwest experienced total darkness before the eclipse veered in Canada. Monday's total eclipse will cast a shadow that will race through 14 states, entering near Lincoln City, Oregon, at 1:16 p.m. ET, moving diagonally across the heartland and then exiting near Charleston, South Carolina, at 2:47 p.m. ET. The path will cut 2,600 miles across the land and will be just 60 to 70 miles wide. Mostly clear skies beckoned along much of the route, according to the National Weather Service. NASA and other scientists will be watching and analyzing from telescopes the ground and in orbit, the International Space Station, airplanes and scores of high-altitude balloons, which will beam back live video. Citizen scientists will monitor animal and plant behavior as daylight turns into twilight and the temperature drops. NASA's associate administrator for science missions, Thomas Zurbuchen, took to the skies for a dry run Sunday. He will usher in the eclipse over the Pacific Coast from a NASA plane. "Can't wait for the cosmic moment Mon morning," he tweeted. Near Victoria, British Columbia, where 91 percent of the sun will be eclipsed, science and math teacher Clayton Uyeda is planning to watch from a ferry along with his wife. He said he is "expecting to have a real sense of connection with the heavens." 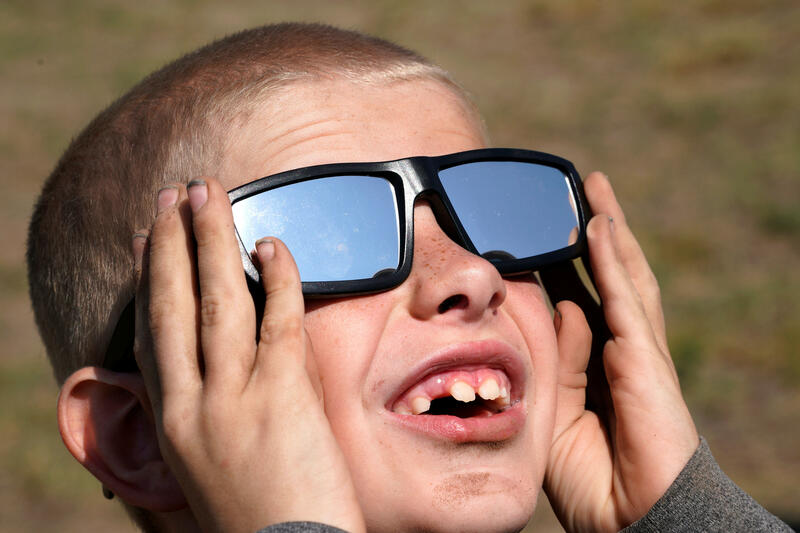 The only time it's safe to look directly without protective eyewear is during totality, when the sun is 100 percent covered. Otherwise, keep the solar specs on or use pinhole projectors that can cast an image of the eclipse into a box. Monday's event will take place in the middle of the workday, which may cost employers as much as $694 million in lost productivity, according to global outplacement and coaching firm Challenger, Grey & Christmas, which analyzed wage and employment data from the Bureau of Labor Statistics. States and cities in the path of the eclipse could suffer productivity losses of almost $200 million. Experts are warning businesses to expect increased absenteeism as millions of people are projected to travel to see the eclipse or take a break from work, which will cause productivity to plummet. Even companies located in areas with a partial eclipse may have a "manic Monday." Challenger, Grey, estimates that the eclipse will cost the Chicago area $28 million, for example. Experts are encouraging employers to make the best of the situation by holding viewing parties and other team-building activities. "A loss of productivity does not necessarily mean that good things cannot come out of this eclipse," said Andrew Challenger, vice president at Challenger, Grey, in a statement. "By considering how this event may impact employee morale, companies can turn this potential monetary loss to a gain when it comes to employee satisfaction." CBS News will bring you live coverage with a CBS News Special Report beginning at 1 p.m. ET on Mon., Aug. 21, and you can watch the event on our 24/7 streaming service CBSN.